March 15, 2019 - The Holiday Inn Express & Suites Klamath Falls, Oregon has won the 2018 Quality Excellence Award from InterContinental Hotels Group (IHG). IHG has 5,000 hotels, over 12 brands in nearly 100 territories and countries. The IHG Quality Excellence Award recognizes hotels with exceptionally high standards in product quality, hotel service delivery and guest satisfaction. 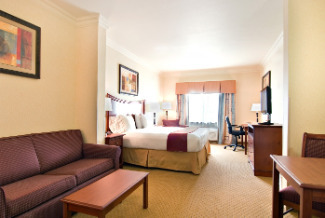 The Holiday Inn Express & Suites Klamath Falls, Oregon is no stranger to recognition from IHG. In 2017, the hotel won 5 of 5 Winning Metrics Award from IHG.